We present a method to quantify DNA methylation based on the 5-methylcytosine (5-mC) dot blot. We determined the 5-mC levels during chondrocyte dedifferentiation. This simple technique could be used to quickly determine the chondrocyte phenotype in ACI treatment. The dedifferentiation of hyaline chondrocytes into fibroblastic chondrocytes often accompanies monolayer expansion of chondrocytes in vitro. The global DNA methylation level of chondrocytes is considered to be a suitable biomarker for the loss of the chondrocyte phenotype. However, results based on different experimental methods can be inconsistent. Therefore, it is important to establish a precise, simple, and rapid method to quantify global DNA methylation levels during chondrocyte dedifferentiation. Current genome-wide methylation analysis techniques largely rely on bisulfite genomic sequencing. Due to DNA degradation during bisulfite conversion, these methods typically require a large sample volume. Other methods used to quantify global DNA methylation levels include high-performance liquid chromatography (HPLC). However, HPLC requires complete digestion of genomic DNA. Additionally, the prohibitively high cost of HPLC instruments limits HPLC's wider application. In this study, genomic DNA (gDNA) was extracted from human chondrocytes cultured with varying number of passages. The gDNA methylation level was detected using a methylation-specific dot blot assay. In this dot blot approach, a gDNA mixture containing the methylated DNA to be detected was spotted directly onto an N+ membrane as a dot inside a previously drawn circular template pattern. Compared with other gel electrophoresis-based blotting approaches and other complex blotting procedures, the dot blot method saves significant time. In addition, dot blots can detect overall DNA methylation level using a commercially available 5-mC antibody. We found that the DNA methylation level differed between the monolayer subcultures, and therefore could play a key role in chondrocyte dedifferentiation. The 5-mC dot blot is a reliable, simple, and rapid method to detect the general DNA methylation level to evaluate chondrocyte phenotype. Autologous chondrocyte implantation (ACI) is a relatively new, state-of-the-art procedure to treat articular cartilage defects1,2. One of the crucial steps in ACI is amplification of chondrocytes via monolayer culture in vitro. During amplification, the hyaline chondrocytes easily lose their phenotype and become dedifferentiated, which is undesirable for ACI treatment3,4. To optimize the outcome of ACI treatment, the extent of chondrocyte dedifferentiation should be determined before replantation. It is imperative to establish an economic and rapid way to determine the chondrocytes' status. Recently, the association between DNA methylation and chondrocyte dedifferentiation has attracted much attention4,5,6. DNA methylation is a process by which methyl groups are added to DNA, resulting in the conversion of cytosine residues to 5-methylcytosine (5-mC). To elucidate the biology of DNA methylation in chondrocyte dedifferentiation, the first step is to evaluate the DNA methylation level of chondrocytes, which so far has proven challenging. Bisulfite genomic sequencing is the most widely used technique to analyze DNA methylation7,8. In this assay, bisulfite conversion causes DNA degradation, and thus a substantial amount of sample must be provided for the assay. Also, high-performance liquid chromatography (HPLC) has been used to quantify global DNA methylation levels9,10. However, HPLC analysis requires genomic DNA digestion. Furthermore, advanced and expensive experimental instruments are required. Therefore, in addition to the high cost, these experimental procedures are time consuming. Anti-5-mC antibodies have now become commercially available, which has created the possibility for immune blotting of 5-mC-containing genomic DNA from complex genomes. In this report, we extracted genomic DNA from chondrocytes grown in a series of monolayer cultures. We used a dot blot assay to evaluate the 5-mC content in human chondrocytes with different numbers of passages. We found that 5-mC content was increased in highly dedifferentiated chondrocytes compared to chondrocytes with low-grade dedifferentiation. Additionally, we identified a relationship between dedifferentiation status and 5-mC levels. Finally, we reported that the changes in 5-mC content were associated with the chondrocyte phenotype. Therefore, the 5-mC dot blot assay is a reliable, simple, and rapid method to detect the DNA methylation level in chondrocytes. This study was approved by the Human Ethics Committee of Shenzhen Second People's Hospital. Prepare Dulbecco's modified eagle medium (DMEM) medium supplemented with 10% fetal bovine serum and 1% penicillin-streptomycin. Prepare 1 mg/mL collagenase II, 0.25% trypsin-EDTA, phosphate-buffered saline (PBS), and a cell strainer (40 µm nylon). Isolate articular cartilage from the knee joints of donor patients after trauma. Obtain informed consent from all participants. Dice the cartilage into 1-2 mm3 pieces using a sterile scalpel and digest chondrocytes from the minced cartilage with 1 mg/mL collagenase II in DMEM at 37 °C for 12-16 h.
Filter the resulting cell suspension through a cell strainer (40 µm) and wash twice with PBS. Count cells with a hemocytometer and seed at a density of 20,000-30,000 cells/cm2 in DMEM supplemented with 10% fetal bovine serum (FBS) and 1% penicillin-streptomycin. Culture in an incubator at 37 °C. 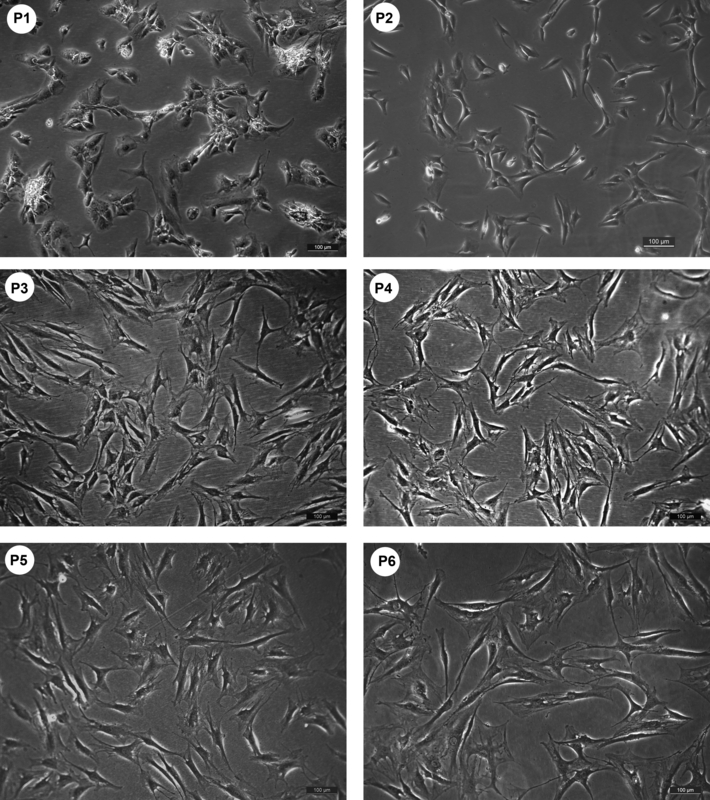 Harvest sub-confluent cells using 0.25% trypsin-EDTA and re-plate at a density of 6,600 cells/cm2. Change the medium twice a week. Culture chondrocytes in monolayers for up to six passages and assess at passages 1, 2, 3, 4 and 5. Collect cells and resuspend in 500 µL lysis buffer (15 mM Tris pH 8.0, 10 mM EDTA pH 8.0, 0.5% SDS, 200 µg/mL RNase A) per 10 million cells. Resuspend cells by pipetting and rapid inversion, and then incubate for 1 h at 37 °C. Add proteinase K at a concentration of 160 µg/mL of cell lysate and invert the mixture vigorously. Incubate 6 h at 55 °C. Add one volume of Tris pH 7.9 saturated phenol:chloroform:isoamyl alcohol (25:24:1) to the sample. Vortex or shake the sample by hand thoroughly for approximately 20 s.
Centrifuge the sample at room temperature for 5 min at 13,000 × g. Remove the upper aqueous phase and transfer the layer to a fresh tube. Extract with an equal volume of chloroform to remove phenol and transfer the top aqueous phase to a fresh tube. Precipitate DNA by adding 0.1 sample volume of 3 M sodium acetate pH 8.0 and 2 volumes of 100% ethanol. Store the tube at -20 °C overnight to precipitate the gDNA. Centrifuge the sample at 4 °C for 10 min at 16,000 x g to pellet gDNA. Wash the sample three times with 70% ethanol, and centrifuge at 4 °C for 2 min at 13,000 x g.
Remove the supernatant carefully and then air-dry. Resuspend the DNA in 10 mM Tris pH 8.0, 0.1 mM EDTA. Use a DNA methylation kit to perform the bisulfite conversion reaction using a total of 500 ng of the genomic DNA, according to manufacturer's protocol. Elute in 10 µL of elution buffer (50 ng/µL). Perform the DNA methylation profiling using a commercial kit according to manufacturer's protocol. Denature the isolated DNA (1 mg per sample) in 0.1 M NaOH for 10 min at 95 °C. Neutralize the DNA with 1 M NH4OAc on ice, and then dilute two-fold. Spot 2 µL of the serial diluted genomic DNA on an N+ membrane. Blot the membrane at 80 °C for 30 min. Block non-specific antibody binding sites by soaking the N+ membrane in 5% BSA in TBS-T for 1 h. Use a 10 cm Petri dish as a reaction chamber at room temperature. After washing 5 min three times in TBST, incubate the membrane with a mouse anti-5-methylcytosine (5-mC) monoclonal antibody (1:1,000) in TBS-T at 4 °C overnight. Wash the membrane for 5 min three times in TBS-T, and then incubate with a secondary antibody, HRP-conjugated sheep anti-mouse immunoglobulin-G (IgG) (1:5,000) in TBS-T for 1 h at room temperature. Wash the membrane for 5 min three times in TBS-T.
Add the enzyme substrate to the membrane and incubate for 5-10 min. Visualize the secondary antibody signal using a chemiluminescence kit according to the manufacturer's instructions. Chondrocytes were cultured in a monolayer up to passage 6 (P6). Chondrocytes showed progressive phenotypic changes with successive passages of the monolayer culture. The P0 chondrocyte morphology was round, whereas the cells became highly pinched and flattened with successive passages up to P6 (Figure 1). This morphology change is typical of the chondrocyte dedifferentiation process. Meanwhile, results of the heat map indicated that the general methylation level of CpG sites increased with prolonged subculture. The 5-mC dot blot analysis further demonstrated that higher CpG methylation levels accompanied the chondrocyte propagation (Figure 2). These results suggested an association between generally increased methylation levels and chondrocyte dedifferentiation. Figure 1: The human chondrocyte morphology observed using an inverted microscope. Please click here to view a larger version of this figure. Figure 2: 5-mC-specific dot blot assay of gDNA of chondrocytes. Genomic DNA was isolated from chondrocytes after varying number of passages. Progressively elevated 5-mC levels were observed. 200 ng, 100 ng, 50 ng and 25 ng of gDNA were loaded per dot. (A) Image of 5-mC-specific dot blot; (B) Dot intensity analysis by the ImageJ. Please click here to view a larger version of this figure. Chondrocyte dedifferentiation in vitro severely compromises the outcome of ACI in the treatment of cartilage defect repair11,12. To optimize ACI outcome, it is crucial to avoid the use of dedifferentiated chondrocytes13. Studies have suggested that general DNA methylation level is associated with the extent of the chondrocyte dedifferentiation4,6. Thus, it is imperative to establish a reliable and rapid method to detect the general DNA methylation status of the chondrocytes before its clinical application. To detect general DNA methylation levels in dedifferentiated human chondrocytes, we could measure the 5-mC level in serially passaged chondrocytes. 5-mC is resistant to deamination by bisulfite treatment. This property was exploited to analyze DNA cytosine methylation patterns using the bisulfite sequencing approach14. Bisulfite genomic sequencing and methylation-sensitive restriction digestion have been regarded as gold-standard technologies for the detection of DNA methylation15,16. These approaches can identify 5-mC with single base-pair resolution. However, the biggest drawback of bisulfite sequencing is DNA degradation during bisulfite conversion. If this approach were used to assess chondrocyte dedifferentiation, it would result in waste of the propagated chondrocytes for ACI. HPLC is another practicable method to quantify global DNA methylation levels, but it is only suitable for laboratories with HPLC equipment. Thus, the need for larger sample volumes or modern equipment makes these approaches impractical for routine 5-mC level testing in typical clinical laboratories. The commercial availability of 5-mC antibody provides the possibility to detect general DNA methylation levels using a dot blot assay. Compared with other blotting techniques, 5-mC dot blot is an easier procedure, which requires neither large quantities of gDNA nor electrophoresis. In addition, the instruments are available in moderately equipped laboratories. Therefore, the 5-mC dot blot method should be applicable as an alternative approach of DNA methylation assay. In this report, we identified an association between higher 5-mC levels and chondrocyte dedifferentiation; 5-mC levels increased with increasing subculture passage. Our findings suggest that 5-mC might be intimately involved in the dedifferentiation caused by monolayer chondrocyte expansion conditions. Importantly, we found higher 5-mC levels were associated with loss of the chondrocyte phenotype, which prevents wide application of ACI to repair cartilage defects. Therefore, our study results suggest that 5-mC dot blotting could be a reliable way to measure the extent of chondrocyte dedifferentiation, in particular when larger numbers of samples and smaller quantities of gDNA are to be analyzed. In order to apply dot blot methods to DNA methylation analysis, the key issue that must be considered is the quality of DNA sample. Therefore, the critical step in 5-mC detection via dot blot is the genomic gDNA extraction step. We suggest researchers use a commercially available gDNA extraction kit to maximize gDNA concentration and purity. In addition, the DNA sample should be loaded onto a nylon membrane. Another important issue is to ensure that the DNA sample has been immobilized and fully absorbed by the nylon membrane. The technique we describe here gives us the opportunity to carry out multiple assays at the lowest cost. An additional advantage of this approach is its reliance on simple and affordable equipment to perform the assay and interpret the results. Also, it can be used to compare relative differences in global methylation levels between 2 or more samples. However, this assay cannot be used for precise quantification of DNA methylation levels or to determine the CpG methylation status of a specific DNA sequence. In addition, this method has limited sensitivity, as the methylation status cannot be accurately detected in gDNA samples below 50 ng. Although this method provides a qualitative analysis of global DNA methylation, it could give rise to false-positive results if performed improperly. In summary, the 5-mC dot blot is a reliable, simple, and rapid method to detect the general DNA methylation level to evaluate the chondrocyte phenotype. This work was supported by the following grants: Natural Science Foundation of China (No. 81572198; No. 81260161; No. 81000460); Natural Science Foundation of Guangdong Province, China (No. 2015A030313772); China Postdoctoral Science Foundation Funded Project (No. 2013M530385); The Medical Research Foundation of Guangdong Province, China (No. A2016314); Shenzhen Science and Technology Projects (No. JCYJ20160301111338144; No. JSGG20151030140325149; No. JSGG20140519105550503; No.GJHZ20130412153906739; No. JCYJ20140414170821160; No.JCYJ20140414170821200).